Marc Nadal » “La condena” Sección Oficial del Festival Internacional Philosophical Film Festival (Macedonia). “La condena” forma parte de la Sección Oficial del 7º Festival Internacional Philosophical Film Festival, festival que se llevará a cabo en Skopje, Macedonia, del 30 de marzo al 8 de abril. Philosophical Film Festival / Филозофски Филмски Фестивал is a unique film festival that lives on the crossroads between philosophy and film and is held annually in R. Macedonia. On one side, the festival tries to promote the idea of film as a medium which can provoke philosophical thought and illustrate philosophical ideas. On the other, it aims to trigger aesthetical analysis’ and investigations into film language as a form sui generis and empower young filmmakers and film workers to reflect on key concepts, questions and ideas in order to translate them into the visual language of cinema. 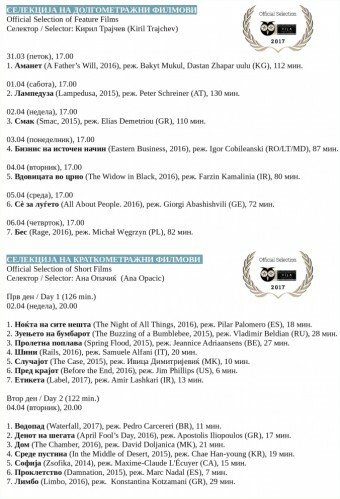 It is a pioneering festival of the kind in Macedonia and the region, and one of few in the world linking film and philosophy.